We were delighted to welcome Lindsey Russell and Radzi Chinyanganya from Blue Peter to our Trees for Life wood at the RHS Garden Harlow Carr to tell them about how the children’s programme inspired our tree planting and protection work around the world. 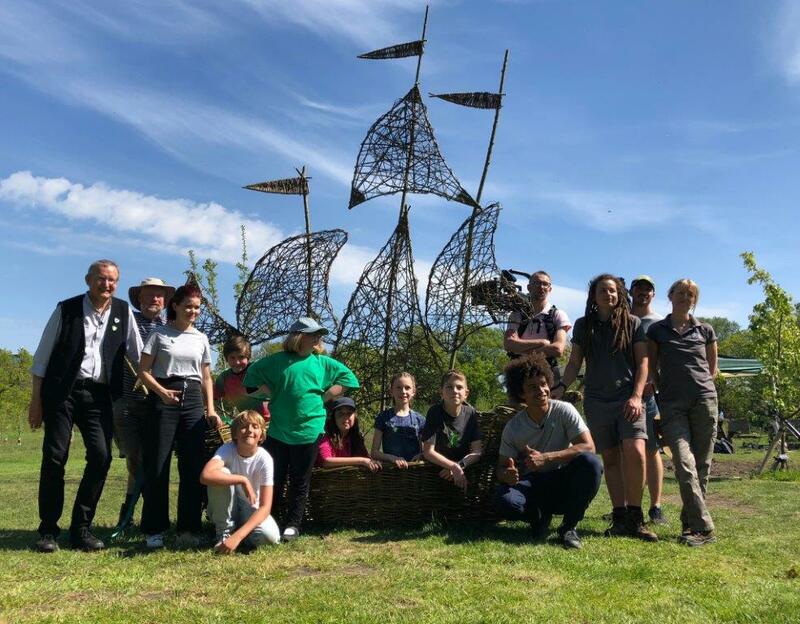 While they were here they helped to build a special willow Blue Peter Ship to celebrate 30 years of the Blue Peter Green Badge which is awarded for contributions with a conservation, nature or environmental theme. In 1989, shortly after the Green Badge was launched, Blue Peter ran an episode on deforestation and how it was impacting the planet. Watching were Chloe and Daniel Wild, from our Bettys family, who were young children at the time. They wanted to know what they could do to help protect the planet and so they went to their father, Jonathan – Bettys family member and former Chairman. He made a promise that if they planted one tree he would plant 999,999 more. Bettys & Taylors ‘Trees for Life’ campaign was born and we reached our millionth tree in 2000. After this milestone we kept on planting and in 2007 Blue Peter helped us to plant our three millionth tree at the RHS Garden Harlow Carr. This area of the garden is now an educational wood for children and visitors to learn about the value of trees for people and planet. The willow ship, which now sits next to our three millionth tree, was hand-crafted by willow weaver, Phil Bradley, with some of the willow harvested from the Trees for Life woodland. The masts of the ship have been planted into the ground in the hope that they’ll take root and be there for many years to come.